Charles Maddock Foundation - Why CMF? The first time I met Charles Maddock he was lying on a gurney in the trauma bay of The Weill Cornell Center of New York Presbyterian Hospital. The chief resident grabbed me and told me about a young male who was a "ped/struck" or pedestrian struck by a motor vehicle. He had sustained a severe brain injury and was in critical condition. Immediately, we took steps to minimize his brain swelling and control his intracranial pressure, which we knew would become dangerously high within the next 12-24 hours. Despite our aggressive measures, which included ventricular drains to drain cerebrospinal fluid and hypertonic saline to reduce the fluid content of the brain, his intracranial pressure still became dangerously high. We rushed him to the operating room for a decompressive craniectomy and removed almost half his skull to accommodate the extreme swelling of his brain. 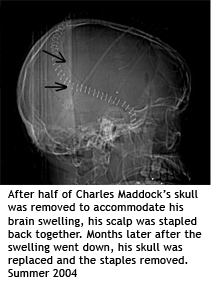 The decompressive craniectomy reduced Charles’ intracranial pressure to within the normal range and over the ensuing weeks he became capable of following commands. Once his brain returned to its normal size, the bone plate was replaced. For Charles, this was only the beginning of an odyssey that would lead him to where he is today. He is the founder of the Charles Maddock Foundation, a non-profit organization whose goal is to aid in preventing severe brain injury and treating its victims. When he first got out of rehab and mentioned the idea of forming a foundation, though I outwardly supported him, I remained skeptical of his ability to see this through once his life returned to normal. But rather quickly, I was proven wrong. Charles immersed himself in the intricacies of nonprofit organizations and developed an understanding of how they achieve their goals; in our case, the intervention and treatment of acute brain injury. He has assembled a group of individuals to help run CMF and has asked me to assemble a board of medical advisors to guide the foundation and determine the optimal use of funds to spur neurological innovation and education. Often times the odds seem stacked against neurosurgeons. Although it is a struggle to preserve neurological function and to retain an individual's personality and spirit, we remain motivated to restore these functions as best we can in those who may never be the same again. Charles Maddock, though not a neurosurgeon, shares this driving spirit after his miraculous recovery. When you see what this man has accomplished since his accident, when most would have been content to go about their days just feeling lucky, you can understand why I have no reservation in supporting Charles and no doubt in his ability to succeed. The foundation's first step is to sponsor research that will have the greatest immediate effect on the outcome of patients suffering acute brain injury. New therapies will be identified and old ones will be reevaluated. This is our goal as directed by the board of the Charles Maddock Foundation and most importantly, by Charles Maddock himself who has experienced and overcome the devastating impacts of a traumatic brain injury. CMF is a registered 501(c)(3) public charity (Tax ID 20-4956364). 100% of your donation is tax-deductible.